Holganix is rebranding its refrigerated plant probiotics as Holganix Bio 800+. Holganix Bio 800+ contains more than 800 species of beneficial, living microorganisms. “We feel that by rebranding our product line as Holganix Bio 800+, we are better illustrating what makes the product line unique—the diversity and quantity of microorganisms present,” said Holganix CEO Barrett Ersek. 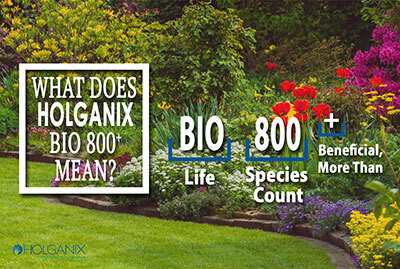 Holganix Bio 800+ uses the 800 species of microorganisms to increase the plant’s tolerance of stress from weather, traffic, diseases and insects; stimulate healthy foliage and root growth; reduce inputs including fertilizer, pesticides and water; and more. Holganix Bio 800+ is field and university tested with more than 70 studies across America, 100 percent organic and DNA fingerprinted, said Holganix.